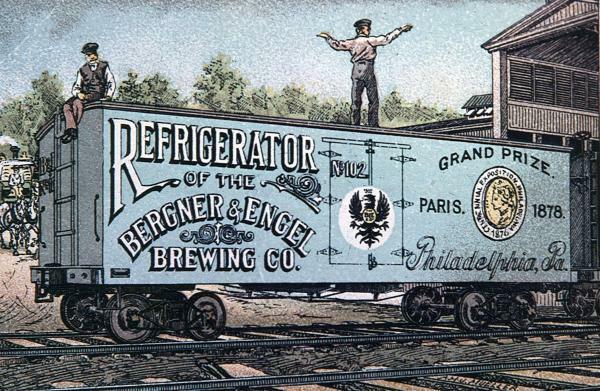 A Bergner and Engel Brewing Company refrigerator railroad car, circa 1880. Flip to A refrigerator freight car, circa 1870. Commonly known as "reefers," refrigerated railroad cars first appeared in the United States in the 1840s and soon revolutionized the shipment of perishable goods. In Philadelphia, ice house vaults dug along the banks of the Schuylkill River stored ice became an important supplier of ice for regional railroads. As shown on the side of this refrigerated railroad car, Philadelphia brewers Bergner and Engel won the Grand Prize at both the 1876 Centennial Exposition held in Philadelphia, and the Paris Exposition of 1878.